Nixon’s 1958 “goodwill tour” resulted in anything but; he was almost killed by enraged crowds that surrounded his car. Oddly enough, the attacks took place in a country with which America today is again in dispute: Venezuela. The incident brought the two countries close to war; the Navy sent “fleet and Marine units to the region,” and while Nixon was uninjured, his reputation, already none too good, was further damaged. For Americans, it was a wakeup call that our country was not universally beloved, as we had been taught in school and supposed it to be. “Death to America” in more modern times was resuscitated in the Iran Revolution of 1979, when Iranian students sieged the U.S. embassy and took 52 Americans hostage. Thanks to television, we were treated nightly to the sight and sound of thousands of [mainly] young, irate Iranians, chanting their familiar cry: Death to America!, and burning the U.S. flag. The Iranians have basically never stopped since, and, with Trump’s pulling out of the Iranian nuclear deal and reimposing sanctions on that country, crowds are again mobilizing and chanting. It’s shocking for Americans to hear foreigners say bad things about us. We tend to think of the U.S. as a benign country, always trying to do the right thing, helping foreigners when calamities strike, defending them against bad guys, and upholding universal values of peace, democracy and progress. Why would they be so ungrateful? Why wouldn’t everybody see us the way see ourselves? Over the weekend, a new facet of “Death to America” emerged in Iran. Before, its implication had been “death” to ALL Americans: the people, the institutions, the nation itself. Which is why it was so easy for politicians in both parties to rally the American people against Iran. Presidents, Democratic and Republican, portrayed it as an existential threat, although Republicans have typically more bellicose (remember George W. Bush’s “Axis of Evil”?). But what’s noteworthy about the weekend’s round of chanting was that Iran’s supreme leader, Ayatollah Ali Khamenei, took the time to explain that it wasn’t America as a whole he wanted death for. “It means death to American leaders, who happen to be these people at this time,” he said, “these people” specifically being Trump, John Bolton and Mike Pompeo. Well, some say, that’s the “fake news” leftwing New York Times. But even as firm a conservative bastion as the wonks at Foreign Policy magazine call Bolton a “national security threat.” His is a name Americans ought to be more aware of, and afraid of. Yet America did not stop. Iran, Argentina, Cuba, Egypt, Guatamala, Congo, Dominican Republic, South Vietnam, Brazil, Chile, Grenada, Venezuela, and who knows how many others—all are countries in which the U.S. sponsored coups d’état, or otherwise sought to undermine. The U.S. is hardly the only major power with a long record of overseas meddling. But no country has outdone America in this respect. Other countries, rightfully, resent us for it. When they say we are trying to impose our values upon them, they have it exactly right. Not all of our cultural values—commercialism, consumerism, anti-intellectualism, disregard for the environment, widespread criminality, horrendous wealth inequality, disrespect for the aged, homophobia, religious interference in government—are admirable. And not all of the values of foreign nations are odious, as American xenophobes tend to claim. To heed Khomenei’s words is neither to support his regime nor to hate America. It is instead to rein in our meddling in other countries that pose little or no threat to us, and to diagnose our own ills which foreign countries do not wish to import. I was raised to have great respect, even reverence, for the President of the United States, no matter who he or she is. My parents were lifelong Democrats, my father more out of habit, my mother because she had thought long and hard about things and decided that the Democratic Party stood more for fairness and decency than the Republican Party, which was as true then as it is now. My mother communicated those values to me, not so much pedagogically, but in that mysterious way that parents teach their children. My mother’s experience of politics was influenced by the Depression and by World War II. The Depression taught her that “normal” solutions to economic and political crises sometimes don’t work; exceptional times call for exceptional approaches. That’s why she revered Franklin Delano Roosevelt. She understood that the New Deal was the kind of radical intervention that America needed to save itself from the excesses of capitalism. FDR died before I was born. By the time I was a little boy, Adlai Stevenson had replaced FDR in my mother’s heart. She was simply and unabashedly in love with him—as, it turned out, many women were. At the same time, my mother loathed Thomas Dewey, who had been our Governor in New York, and had run for president against Truman in 1948. Dewey and Stevenson formed the guardrails of my budding appreciation of politics: Dewey the Republican bad, Stevenson the Democrat good. These were childish apprehensions. They took no notice of nuance. I was strongly in favor of John F. Kennedy for the 1960 election, but if you’d asked me why, I don’t think I could have given you a coherent answer, except for the fact that he was young, vigorous, handsome and forward-thinking. Those were qualities that appealed to a young Baby Boomer. I was just turned 13. The Sixties interfered with my appreciation of politics. I took a bit of a sabbatical, focusing instead on more spiritual and cultural issues. When Nixon was elected, I had no horse in the race. I kept very close attention to the burgeoning Watergate situation, however, and in my circle I was the guy who could explain to my friends what was going on. But it wasn’t until the 1978 primaries that for the first time since JFK I took notice of who was running and what they were saying. I fell in love with Jimmy Carter. His honesty and sincerity turned me on; and of course, he was elected. By the 1980 election, I was for him, although I wasn’t particularly turned off by Reagan. Reagan won. I didn’t care all that much. 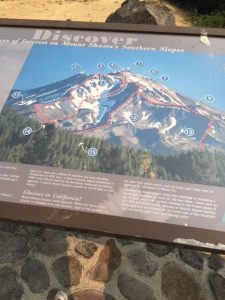 As a newly minted career climber, lately arrived in San Francisco, I was busy focusing on my own stuff. In 1988 I happened to see an interview on C-SPAN where Brian Lamb interviewed the Governor of Arkansas, Bill Clinton. It was like the lightbulb went off over my head. Wow. I knew that was the guy I wanted to be President. I wrote him a letter (addressed only to Bill Cllnton, Little Rock) saying so. He wrote back; I still have the letter. Four years later he was elected President, and I have never looked back on my commitment to the Democratic Party. In 2000, I didn’t vote for George W. Bush but I never hated on him. I saw in him a good man. We differed on many issues, but I didn’t think he was evil. He seemed to love America, which I do too. I thought his religious attraction to evangelicism perverted his views on things, especially homosexuality, but by then I was mature enough to realize that reasonable people can disagree. By the time the Bush presidency was over and the 2008 election was upon us, I was a strong supporter of Hillary Clinton, so I was disappointed when she lost the nomination to Obama. But it didn’t take me long to fall in love with Obama, and when he won—I’ll never forget him walking onstage in Chicago with Michelle and the girls—I was on my feet in front of the T.V., tears falling down my face. We’ll have to leave it to historians to decide on the Obama presidency, but in my opinion, he was a near-great. I thought Bill Clinton had kept the flame of liberalism alive while the winds of reaction tried to snuff it out. With Obama, I saw him struggle to advance the cause. He might have been braver, more daring; but he was a bulwark for liberalism, which was under constant attack. Then came Trump. My mother, steeped in the tradition of liberality and decency, would have loathed him. I’m glad she’s not here to witness this abomination. Even before Trump won with the help of the Russians, I knew he was a disaster. For the first time in my life—and I’m almost 73—I hated the President of the United States. But my hatred isn’t permanent. I still have a deep well of reverence for the office. It won’t take much for me to once again esteem him or her. But not while this vile person occupies the Oval Office. Marijuana is now legal in California. To tell you the truth, I was afraid that when it was legalized, people would be smoking it everywhere on the streets, making it hard for pedestrians to walk around without getting frequent, hefty doses of second-hand pot smoke resulting in a contact high. Although I like pot, constantly smelling it when I don’t want to was something I worried about. But I needn’t have. Yes, it’s true that here in Oakland—a town in which lots of people indulge in weed—I do occasionally get a whiff of grass as I’m out and about. But it’s been far, far less than I’d anticipated. Why, I don’t know, but I’m glad it’s so. In fact, by the late 1960s, the legalization of pot seemed further away than ever. I’d begun smoking it as a college freshman in 1963. I smoked a lot during my undergraduate years (and did a lot of other recreational drugs as well). I even dabbled in a bit of dealing, not so much to make money, as just to give myself free grass. It was easy enough to drive down to New York City from my college (Clark University, in Worcester, Mass. ), score a pound for $120, divide it into ounces, sell the ounces at $15 each (can you believe it?) and keep two ounces for my personal use. I was not, in other words, a bigtime dealer. But I was big enough for the Worcester Telegram, the local newspaper, to run a front page headline when I was busted in the Spring of 1968. The two ounces I was caught with turned out to be the biggest drug bust in the history of Worcester, which then was New England’s second-largest city. I was promptly hauled off to jail, in the middle of the night, with six of my roommates in the apartment we all shared (the infamous 5 May Street, where there was a party 24/7), a few blocks from campus. In the end, I got off relatively lightly: a few nights in jail pending hearings, and a $1,000 fine, which my parents paid. But when the whole dreary business was over, I found it had left behind a bruising residue: paranoia. I was terrified of getting busted again. If that happened, I knew I would face serious jail time. I moved out of 5 May Street in order to live alone and quietly. My new place was on Water Street, in a sketchy part of Worcester, near the produce district. It was a tiny apartment, which I painted lilac and pale green. I adopted two noisy Persian cats to keep me company. I bought a bicycle to travel to and from campus (about 1-1/2 miles away). And I continued to get high, despite the considerable risk I ran of getting re-arrested. Such was my paranoia that I took extraordinary steps to cover my tracks. Literally. There was a crawl space you reached from the bathroom, next to the toilet. It led to the dirt foundation on which the house was built. I kept my stash buried at the very back of the crawl space, where the ceiling was so low that a big cop couldn’t have even fit. In crawling to my burying place, I of course upset the soil, so that, as I backed out, I would take a small brush and rub it over my tracks. No footprints or kneeprints, nothing to indicate that any human had ever been there. Back then, my method of smoking was to roll joints in Zig-Zags. My pot wasn’t particularly clean. I would strain it, but it still contained seeds. If you’ve ever smoked pot with seeds in a joint, you know that the seeds can explode from the heat. They go Pop! and fly off, landing on the floor, sometimes a considerable distance away. Every time I heard a seed pop, I’d get down on my hands and knees—stoned, mind you—and not be able to relax until I found the potentially incriminating evidence and disposed of it. I was not going to jail for a damned seed! Every sound from outside on the sidewalk, every car on the street frightened me and caused my heart to leap. Was it the cops again? Did they know what I was doing? I didn’t see how they could, but having been busted once, I could easily be busted again. For all I knew, they were spying on me. Some people used to say that smoking pot made them paranoid, but I wonder if it was the pot so much as the fear of being arrested. Much of my generation of Baby Boomers was paranoid in those days, for that very reason. I wonder how this affected their/our subsequent behavior and attitudes. Are there studies on this? Did it impact our political beliefs? Our social relationships? Did it make us more inclined to believe in conspiracy theories? Did it make some of us anti-cop? Anyhow, kids today don’t have to worry about getting busted for pot, and that is a good thing. I left Oakland for my drive north at noon on Saturday. The morning fog had burned off, and the sky was sunny and blue. I first smelled the fire 125 miles south of Redding, in Yolo County, north of Vacaville, even with all the car windows shut and the AC on. By the Colusa County line, the sky had turned a milky, opaque silver. It looked like fog, but wasn’t. It was smoke from the Carr Fire, drifting south. I parked the car to walk Gus. The smell! Dirty dog, like when Gus needs a bath. But it wasn’t Gus. It was ash, burnt wood, and lots of other incinerated stuff. The farther north we got up the I-5, the darker and hazier the air became. Visibility was sharply reduced, and it was fiercely hot. At 3 in the afternoon on a late July day in the Sacramento Valley, that sky should have been blindingly blue, not mother-of-pearl. 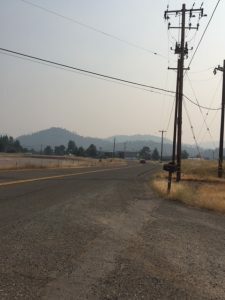 In Red Bluff, 27 miles south of Redding, things were really bad. The haze was super-thick—this picture hardly does it justice. the way it must look from Neptune. The smell was very strong, very bad: a burnt-out fireplace. People were wearing face masks. We stayed that night in Red Bluff. A few days earlier, I’d had an email from a guy who reads my blog, name of Alain Teutschmann, who owns Mount Tehama Winery, in Manton, a tiny town (population 347) southeast of Redding, in the Sierra Foothills. He’d read on my blog last week that I’d be in Red Bluff and wondered if we could meet. Sure. 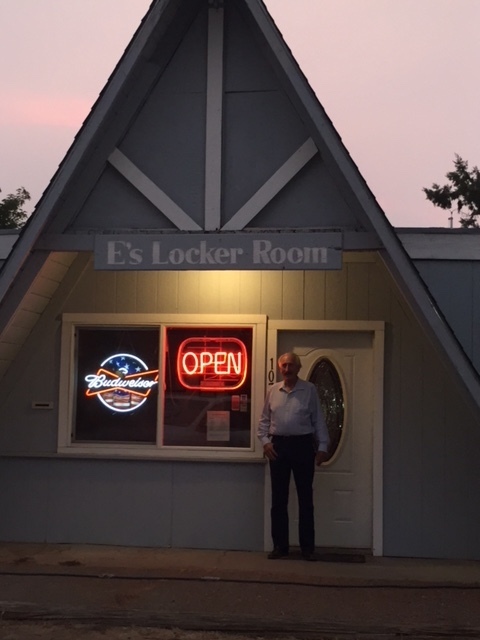 He took me to a dive bar—my favorite kind—out in the boonies, E’s Locker Room. They don’t have a website but they are on Facebook. 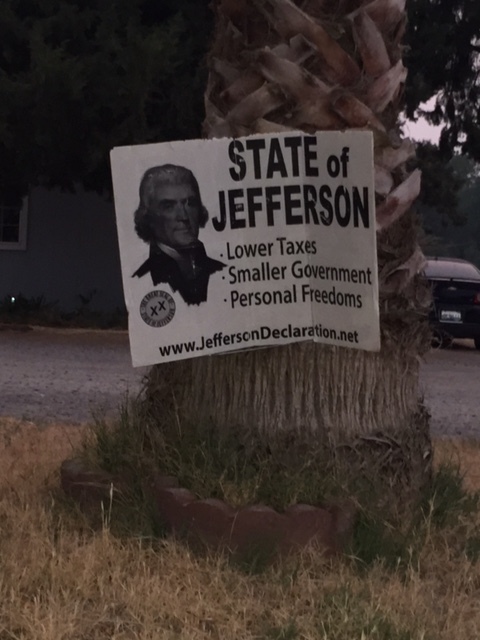 Here’s a poster on a tree that tells visitors they are now in the State, not of California, but Jefferson. “Good question,” said the bartender, without offering an answer. I wish he had. This is what these anti-government, anti-tax types never consider. There are thousands and thousands of firefighters (some of them dying), rescue personnel, private contractors driving heavy equipment (also dying), doctors and nurses, cops and law enforcement—you name it, fighting the Carr Fire and helping the people. Someone has to pay them. Someone has to pay for the gasoline for the water-dropping planes and vehicles. For that matter, someone has to pay for the paved roads the firetrucks and ambulances drive on. Someone has to pay for all of the infrastructure. And yet these tea party types demand “no government, no taxes.” With all due respect, I think they sit around at night drinking and getting stoned and complaining about “Big Gummint” taking all their money and giving it to the Blacks and Mexicans. Yet when their community is on fire they expect the Feds and the State to come in and rescue them. What can you say to such unreasonable people? I awoke on Sunday morning to nonstop local T.V. coverage: evacuation centers, reports by officials on the fire’s progress, weather forecasts, road closures. The weather was not favorable to the firefighters. The smell of ashes was stronger than ever. I departed Red Bluff northward with great trepidation, not knowing what I would find in Redding. 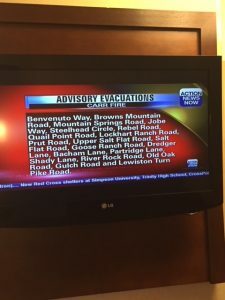 Someone had said on Saturday night the I-5 was reduced to six miles an hour due to the gridlock of mass evacuations and ambulances and firetrucks. Getting through Redding, though, was easy. The freeway was mercifully free of vehicles. The good news, I suppose, was that the high temperature would be “only” 100 degrees, as against Friday’s 113. Humidity ten percent, winds gusting and erratic, exactly what the firefighters don’t need. 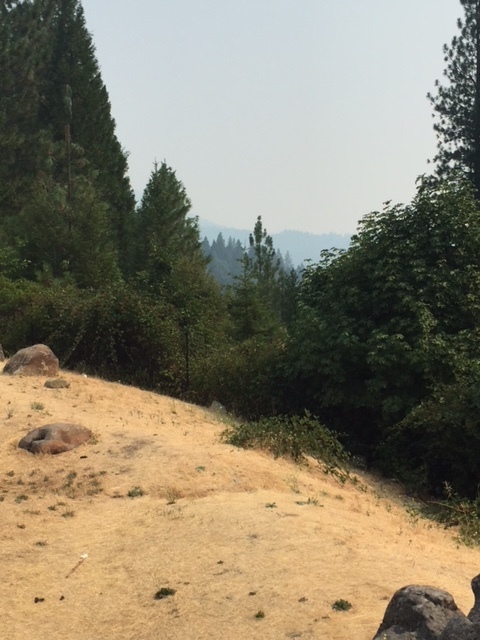 For the folks who live in these parts, the Carr Fire is a catastrophe. Redding has about 90,000 people. Add in a few thousand more for the little mountain towns to the west—the fire’s epicenter—and it’s still a small community. Thirty-eight thousand had already been evacuated—nearly half the entire regional population. Many roads were closed. And the death toll was rising: six by Sunday evening, with many areas still on fire, and thus unsearchable by rescue squads. 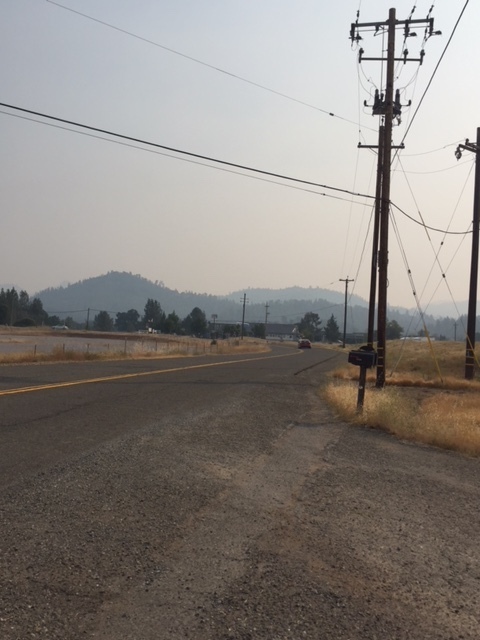 As I drove on from Redding up towards my next stop, Medford, Oregon, I kept the radio on the local stations, and it seemed like everybody in the entire vicinity was volunteering to help: people offered their barns and pastures for displaced livestock, their homes for the evacuated, food, clothing, rides, cell phone chargers, prayers. That’s the best part of Jefferson State. But I like to think that would happen in Oakland, too, or anywhere in the U.S. Nothing. A nearly 10,000-foot tall mountain, totally obscured by smoke. 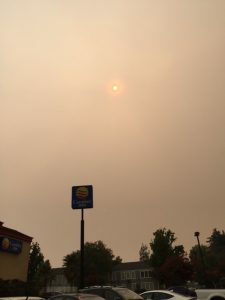 Even in Medford—200 miles north of Redding—the sky was filled with smoke, and the air quality was horrible. But there are fires here, too. There are fires up and down the entire West Coast. 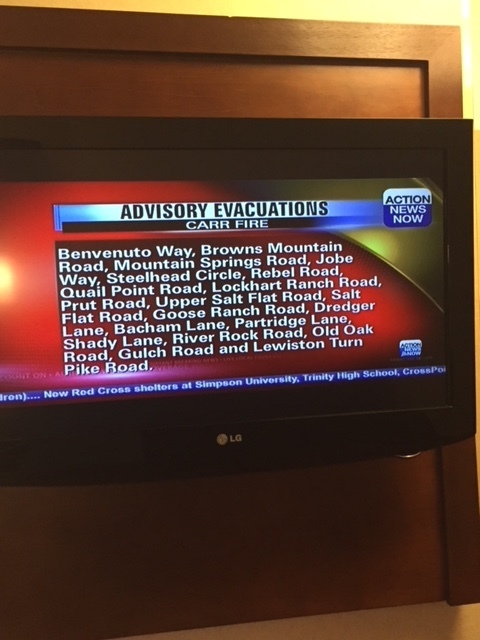 “Oregon is on fire,” the local T.V. news anchor in Medford said on Sunday evening. It’s terrible, horrible, heartbreaking. But Donald J. Trump and his allies tell us that climate change is a myth, that the weather isn’t getting hotter, that elite scientists and Democrats are lying. Please, Jefferson people, if you read this, think! Rise above your anger and use your God-given brain. You good people have backed the wrong side, and they’re screwing you blind. I’m driving up to Seattle with Gus on Saturday for my grand-niece’s bat mitzvah. I could just fly, but I want to take Gus with me, and he’s not an official service dog, so that means the car. It will be a slow trip, maybe 150 miles a day, with plenty of stops along the way. I’ll be going up on the inland route—Highway 5—instead of the Interstate 101, along the coast. Reason is, I get cold very easily, following a 2002 incident in which a rowboat I was on overturned in the cold Russian River. My friend and I were trapped in the water for a long time, and I developed hypothermia. Ever since, my body’s thermostat has been haywire, with the result that in the wintertime, in particular, I’m cold pretty much all the time. This past winter, all I could think of was being in the Central Valley this summer, where I could bake to my heart’s content and not be cold. My route will take me through some pretty hot places, like Redding and Red Bluff. As I type these words (Thursday afternoon), Google tells me it’s currently 110 in Redding. The high tomorrow (Friday) will be 111. That’s pretty hot; in fact, the only other time in my life I experienced 111 degrees was years ago, in Paso Robles, when the heat was so crushing I had to take refuge in the air-conditioned library. I think I’m better prepared to handle the heat now, though. As for Gus, I’ll have to take extra care of him. He doesn’t like the heat, so we’ll walk in the early morning and later at night. And I’ll keep both of us hydrated. I like going to out-of-the-way places that are off the tourist beaten path: Medford, Roseburg, Salem. It’s fun to explore these towns and small cities, checking out restaurants and bookstores, finding new bars, meeting new people, seeing the sights. Once you get out of the Bay Area and up towards the California-Oregon border, you leave Blue State territory and enter Red land. Siskiyou County went for Trump over Hillary 56.5% to 35.8%. Shasta was even more lopsided, 65.6% to 28.2%. Locals call that part of the country “Jefferson,” and they wouldn’t mind not being part of either California or Oregon. There are also a lot of libertarians. It will be interesting the meet some of the Trumpers, have a few beers or whatever with them, and sound out their feelings about Trump. After all the scandals and lies, are they having second thoughts? Cute, huh! That was a long time ago. Dwight Eisenhower was president, but JFK was running hard, and I was already attracted to him through the T.V. A year or so later, after he’d gotten the nomination, I read in the New York Journal-American that he would be at a campaign stop at the Concourse Plaza Hotel, which was just a few blocks away from my building in The Bronx. (The Concourse Plaza was where the New York Yankees lived during the season.) I sawed the handle off one of my mother’s brooms, bought a big piece of posterboard and wrote, with a big Magic Marker, “All the Way with JFK!” When I got to the hotel, there were sawhorses set up at the side entrance and only a few cops and spectators. A black car pulled up and JFK got out. He stood, straightened his tie, gave me a little smile with a nod of the head when he saw my sign, and disappeared inside. That was the closest I ever got to a future President of the United States. Telling that story reminds me of a Mickey Mantle moment. I was a real autograph hound as a kid. The Yankees were easy to find during the season (they’d shop at the local A&P supermarket, buy pastries at G&H Bakery, wait in line for smokes at the drugstore), and you could always spot a Mantle, a Berra, Ford or Kubek on the street, and mostly they’d be happy to sign an autograph book. 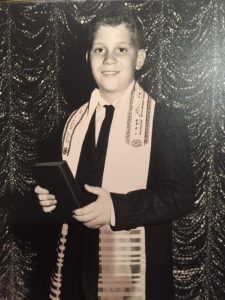 But Mantle had a reputation among us kids. He could be super-charming, but if he’d had a bad day (like striking out a lot, which he did), he could be mean. You never knew. (Of course, we now know that he was an alcoholic.) I already had his autograph six times, but when I saw him that day, crossing 161st Street, I wanted #7. I caught up to him at the pedestrian island. “Mick, can I have your autograph?” Evidently, he’d had a bad day, for he shoved me to the ground and walked away. Can you imagine a professional baseball player physically assaulting a little kid today? Headlines! Lawyers! Big trouble! But those days were different. Actually, I didn’t mind it in the least. I was shoved by Mickey Mantle! Pretty cool! Have a great weekend. More on Monday.